It's owl mania in the streets tonight, and this exciting slot is giving away a whole stack of cash with each feathery friend combination. Click here to play! Get in on the action for your chance as some hefty jackpots. 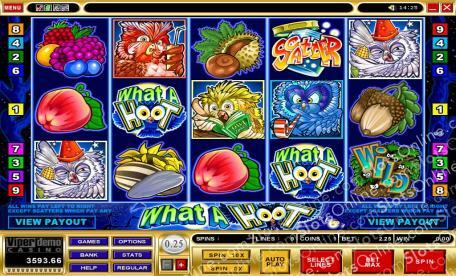 What A Hoot is a fun 5-reel slot played across 9 pay lines, where the more lines activated will increase your payout odds on winning combinations. The Wild symbol will substitute for any other symbol on the reels except Scatters, but does not give any payouts on standalone spins. The Scattered Jar pays out up to 50 times your wager and will be multiplied by the total number of credits staked. All the owls will pay out excessively when 2 or more of them appear on active pay lines, but the What A Hoot symbol is the best with up to 5000 times your initial stake payout odds. Play What A Hoot today for your chance at some huge cash winnings. The Scattered Jar pays out up to 50 times your intiial wager and can appear on any reel. The Wild symbol doesn't pay out but can be substituted for any other symbol except Scatters.